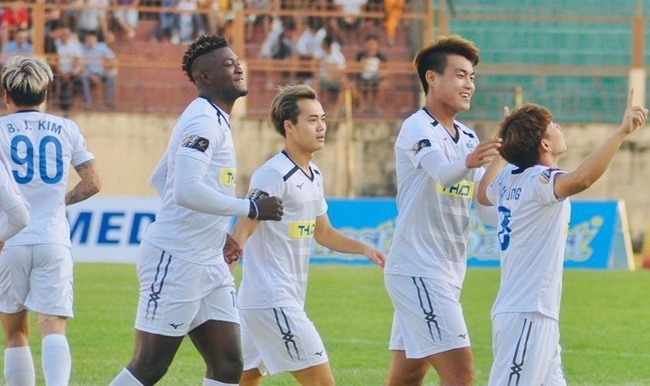 HÀ NỘI — Hoàng Anh Gia Lai (HAGL) beat Đắk Lắk in the qualifying round of the National Cup on Sunday. In the Central Highlands province of Đắk Lắk, HAGL dominated the game from the opening whistle. In the 27th minute, Nguyễn Phong Hồng Duy beat the Đắk Lắk defence to open the account. A few minutes later HAGL had the chance to double the score when striker Nguyễn Văn Toàn beat the offside trap and was fouled in the penalty area. Midfielder Trần Minh Vương took the resultant penalty and deceived goalkeeper Y Êli Niê only for his shot to hit the cross bar. After the break, Vương atoned for his mistake with a goal to make the score 2-0. Đắk Lắk fought strongly but failed to break down the HAGL defence.